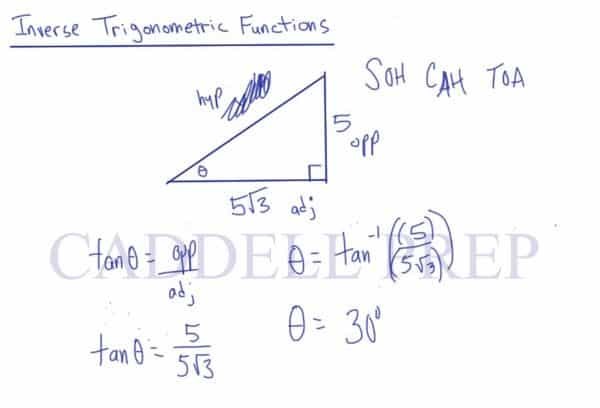 In this lesson, we’re going to go over inverse trigonometric functions. The same SOHCAHTOA from the previous lesson will be needed to perform the functions. Perform the inverse of sin in this situation. If you remember from sine, cosine, and tangent, we use those to find missing sides when we have an angle and one side. We use inverse trigonometric functions to find the angle. Let’s draw a right triangle and we are given two sides. And we have to find the angle theta. First, let’s choose which trigonometric function to use. Here we have an angle, the opposite side, and the hypotenuse. and we need to find what theta is. Some students confused the solution to divide by sine. But that’s not the case. Because it’s not sine times theta. It is the sine of theta. So, what we need to do is the inverse of sine. Let’s do the inverse of sine on both sides. Please note that . They have the same meaning. Again, if we’re looking for the angle, we eventually should do the inverse of sine, cosine, and tangent. But we can start by setting it up with our regular formula. And this is true in any combination. Not only in sine. For example, we don’t have the value of the opposite side. and we’re still looking for the angle theta. So, we should use the formula for cosine. Again, we have to do the inverse of cosine. Now, let’s see one more example. We’ll usse the inverse of tangent. Here, the hypotenuse isn’t given. But we have the opposite side and the same value for the adjacent. So, let’s use the formula for tangent. Now, to get the theta, we’ll use the inverse of tangent on both sides. Again, if we have two sides and we’re missing the angle, we can easily just set up our sine, cosine, and tangent functions like normal. Then to solve for theta, we’ll do the inverse of that trigonometric function.